Or, to put that another way: If we can avoid harming animals, why wouldn't we? The production of milk requires that the cow be in lactation, which is a result of the cow having given birth to a calf. 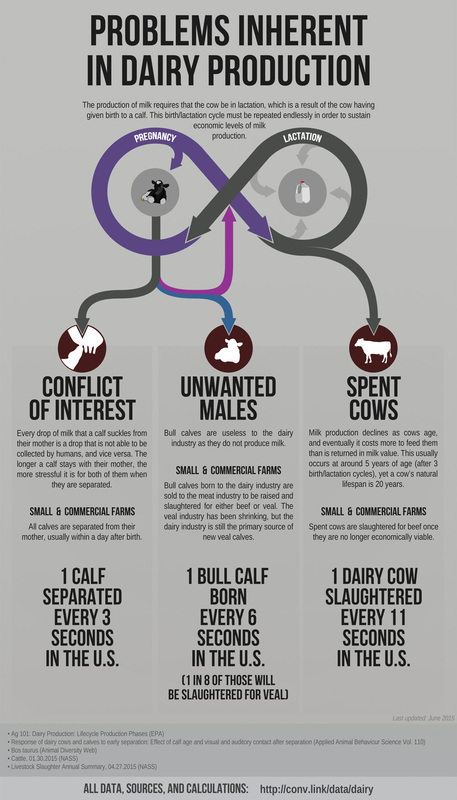 This birth/lactation cycle must be repeated endlessly in order to sustain economic levels of milk production. Every drop of milk that a calf suckles from their mother is a drop that is not able to be collected by humans, and vice versa. The longer a calf stays with their mother, the more stressful it is for both of them when they are separated. All calves are separated from their mother, usually within a day after birth. Bull calves are useless to the dairy industry as they do not produce milk. Bull calves born to the dairy industry are sold to the meat industry to be raised and slaughtered for either beef or veal. The veal industry has been shrinking, but the dairy industry is still the primary source of new veal calves. Milk production declines as cows age, and eventually it costs more to feed them than is returned in milk value. This usually occurs at around 5 years of age (after 3 birth/lactation cycles), yet a cow’s natural lifespan is 20 years. Spent cows are slaughtered for beef once they are no longer economically viable. Egg production declines as hens age, and eventually it costs more to feed them than is returned in egg value. This usually occurs at around 2 years of age, yet a chicken’s natural lifespan is 5-10 years. Spent hens are slaughtered at 2 years of age and the carcass is either exported, used for low-quality processed foods/pet foods, composted, or landfilled. Some people may allow their hens to live out their lives while producing fewer eggs. Others may butcher spent hens for home use. Every egg that is hatched to create a replacement layer hen has a 50% chance of being male, whom are useless to the egg industry and unwanted by the meat industry (modern 'broilers' are a separate strain). Once sexed (within days of hatching), males are 'culled' using one of the following methods: a high-speed grinder (maceration), asphyxiation, cervical dislocation (snapping the spine), electrocution, or suffocation. Replacement hens are usually purchased from commercial suppliers (see above). All the major dietetics and health organizations in the world agree that vegan and vegetarian diets are just as healthy as omnivorous diets. Which dietary changes have the most impact? When looking at the total number of animals killed by each animal-based-food industry in the United States, we arrive at a somewhat unintuitive result right away: the egg industry kills far more animals per year than might be expected. However, it doesn't stop there.